Ideal for mounting over packet machines. Up to 8 augers are available.Typical center distance is from 1.5” to 4”. The Image 7000 multi filler is utilized for filling 2-8 pockets at one time. 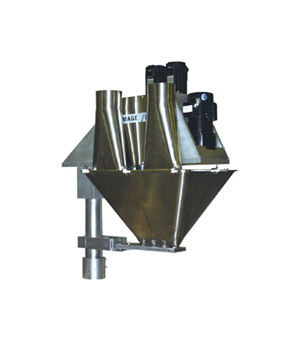 From 2-4” center distance between fill sizes the Image 7000 can be adapted to packet, sachet, or multi lane conveyors. Both free flowing and non free flowing products can be filled.